Enough Project Policy Alerts provide a reaction and set of recommnendations to a significant development designed for policymakers, advocates, and other influential people participating in the policy making process. The new peace enforcement brigade approved by the UN Security Council on March 28, 2013 to operate under the United Nations Organization Stabilization Mission for the Democratic Republic of Congo, or MONUSCO, presents an opportunity to significantly reduce the strength of illegal armed groups if paired with special forces training, a robust defections program , and a comprehensive peace process led by new U.N. Envoy Mary Robinson. The brigade, formally known as the Force Intervention Brigade, is intended to “neutralize and disarm” the M23 and other Congolese and foreign armed groups through targeted operations. It presents an opportunity for a strategic partnership between the United States, the U.N., and regional governments to target spoiler armed groups, such as the FDLR and M23, that don’t sign peace accords. A strategic advising partnership between the United States, Uganda, and the African Union, or A.U., in which the United States has deployed 100 Special Forces military advisors, has helped significantly reduce the threat of the Lord’s Resistance Army, or LRA. 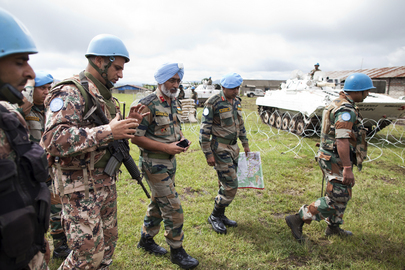 A similar U.S. initiative to train and equip the U.N. brigade and support intelligence gathering could be instrumental to the brigade’s success. A robust and well-resourced disarmament, demobilization, repatriation, reintegration, and resettlement program, or DDR/RR, for foreign and domestic armed groups will also be critical to the U.N. Brigades success. A two-pronged “push” and “pull” strategy is already having an effect on increasing defections from the LRA and should be developed for Congo with the support of the U.N. Secretariat and key missions to the U.N. As armed groups have increasingly less access to natural resources because of new international due diligence measures that make it difficult to sell conflict minerals, enhanced defection programs are particularly timely. MONUSCO's DDR/RR projects for foreign armed groups have had some success but are under-resourced. The Congolese government’s DDR programming for domestic armed groups needs increased support and to be implemented. Community buy in and support for reintegration projects that benefit both local communities and ex-combatants would prevent the formation of new armed groups simply by enabling combatants to enter communities safely and receive DDR packages, which has been the case in the past. Other components of a successful DDR/RR and DDR program include leaflet dropping and radio programs aimed at luring combatants out of the armed groups, the relocation and resettlement of ex-combatants to other provinces, and the creation of new demobilization centers. Lastly, building on lessons from other U.N. peacekeeping operations in West Africa, the Military Observers, or MILOBS, team of 700 observers should be deployed to resource-rich areas such as Walikale and be tasked to examine minerals trading routes, and search, monitor, and report on illicit trafficking. Meanwhile, UN Envoy Mary Robinson must move quickly to build a peace process to operationalize the commitments made in the Peace, Security and Cooperation Framework for the Democratic Republic of Congo and the Region, or Framework, and begin talks that can lead to the ongoing engagement of Congo, Uganda and Rwanda before the next A.U. summit in May. The United States should quickly appoint a high-level special envoy to work directly with Robinson and regional governments to organize the process. The Framework commits regional states to address critical political, security, and economic drivers of the conflict. In order to have an impact on the ground, these broad commitments must be pursued through a sustained negotiation process led by Robinson. Competition over control of natural resources has been a critical driver of conflict in the region, as armed groups backed by regional governments have sustained themselves with profits from the illicit trade in natural resources. In order for the Framework to be implemented1 a regional peace process is needed between Congo, Rwanda, and Uganda to come to agreement about legitimate, conflict-free economic development and integration. The Framework also commits Congo to undertake institutional reform on critical issues that drive instability. A multi-faceted institutional reform process is needed with proposals from both the Congolese government and civil society. The International Conference on the Great Lakes Region, the A.U., Robinson, and the head of MONUSCO (current head Roger Meece is due to step down in June) can help facilitate a national dialogue that respects the constitution and ensures the participation of women’s groups, civil society, government, key armed groups, and political parties to discuss reform proposals including decentralization and security sector reform. In the Framework, the international community committed to “work towards the revitalization of the Economic Community of the Great Lakes Countries (CEPGL) and support the implementation of its economic development and integration agenda” and the region agreed to “strengthen regional cooperation including deepening economic integration with special consideration for the exploitation of natural resources.” The “Peace, Security and Cooperation Framework for the Democratic Republic of Congo and the Region”. Available at http://www.scribd.com/doc/127251407/Peace-Security-and-Cooperation-Framework-for-the-Democratic-Republic-of-Congo-and-the-region (accessed February 2013).